molasses is – pretty clearly – something i enjoy. the sticky sweet, intense flavor infused with just a little bit of bitterness is almost addictive. complex, layered and deeply delicious, its heady aroma and distinctive taste are perfect pretty much all year round, but it's especially ideal for the holiday season. and when paired with sweet fall fruits, like juicy pears and tart apples? well, the combo is a seriously winning one. the final addition that really puts these cakes over the top is a strong hit of ginger laced throughout all that gorgeously moist, bittersweet cake – it's just enough of a kick to balance all those different layers of flavor, and give them a spiced scent reminiscent of the classic gingerbread cookie (but i promise, you'll like these SO much better). 1. put the butter, molasses, dark brown sugar and granulated sugar in a saucepan and whisk together over medium-low heat as butter melts. continue whisking until sugars have melted and are fully incorporated (at this stage, the molasses will look slightly separated from the butter, and that’s totally normal and fine). turn off heat. 2. mix all dry ingredients (flours, baking soda and powder, salt, ginger, allspice, and espresso powder) in a large bowl, using a whisk or fork to combine/aerate. 3. to the saucepan with the butter and sugars, add vanilla, eggs and egg white, heavy cream and almond milk. whisk to combine thoroughly. 4. pour wet ingredients into the dry and whisk everything together until it's completely smooth and combined (no lumps!). you'll end up with a lusciously rich and thick-looking batter. 5. prepare the fruit topping: cut the ends off of each of the fruits, cut each into 4 pieces, and cut out middle section with seeds from each piece (going top to bottom). Lay fruit on newly cut, flat side horizontally and cut thin slices (you want shorter pieces for these tiny pieces, so make sure you aren’t cutting vertically). fanning the apple and pear slices around the the bottom of the bundt pans will give these cakes a pretty top. the extra bit of brown sugar underneath ensures everything stays in place and adds a lovely, caramelized sweetness to the fruit. 6. spray baby bundt pan with cooking spray, sprinkle with brown sugar (about a teaspoon or so per bundt) and then fan fruit slices into the bottom of each bundt, alternating between pears and apples every two slices (see photo above). 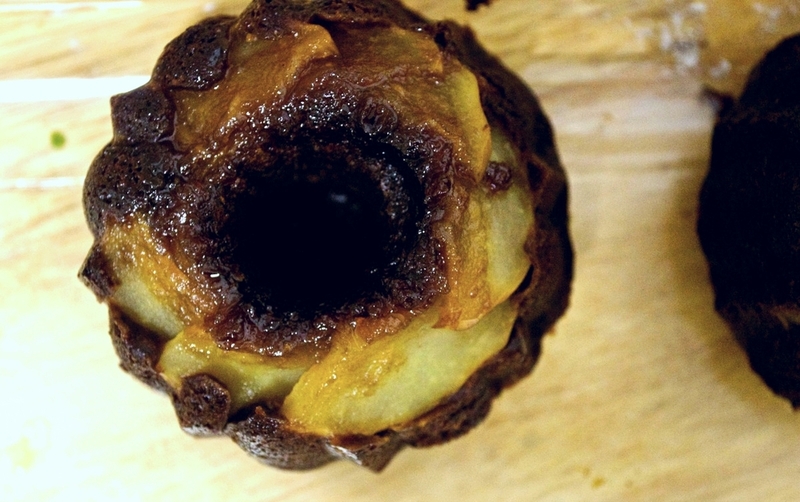 top with batter, filling about ¾ way up the inside of each bundt mold, and then bake at 350° F for 20 minutes, or until toothpick inserted into cake comes out clean. 7. let cool for another 20-25 minutes before attempting to turn them out, loosening the sides of the cakes first with a butter knife. allow to cool completely on a wire rack before consuming or storing. this makes so many cakes (i got 14 out of this recipe)! you can certainly freeze some to save for unexpected guests, but they'd also make a tasty and thoughtful gift, if wrapped up in a cellophane bag and tied with a festive piece of ribbon.